The battle that right-holders have been waging against P2P users has proved largely unsuccessful so far. 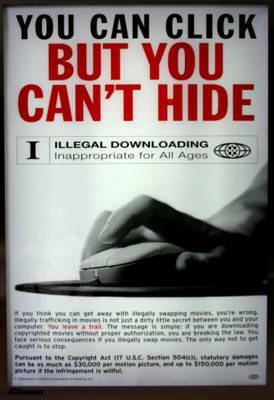 In the US, the methods used by the recording industry’s lobby (RIAA) to track down “pirates” are put into question; in France, the penal sanctions provided by a 2006 Act on author’s rights have had no effect in stopping illegal downloading, and the digital music market is still developing extremely slowly (8% of total music sales). This year in France, Sarkozy’s government claimed to have found the solution to this endemic problem with the Olivennes Report, an agreement among right holders and Internet Service Providers named after its main author (former head of FNAC, France’s biggest record retailer). The report, which is currently being translated into a bill, would create a new independent authority in charge of dealing with internet copyright infringements. Alerted by right holders who would be given the right of monitoring internet networks to collect personal data about wrongdoers, this public authority would send warning messages to internet subscribers accused of illegal downloading. If other copyright infringements were to be observed, this authority could order ISPs to suspend the incriminated user’s internet access for a duration of up to 12 months (it is only if the user appealed the decision that a judge would be called upon)! This came as a blow for Sarkozy’s government. But in spite of this downfall, the Culture Minister Christine Albanel soothed rights holders saying that she would push the bill through Parliament before the summer anyway. Not surprisingly, the proposal was also seriously weakened earlier this week by the preliminary report of the State Council (Conseil d’État), a court of senior jurists that advises the government on legislative bills and also acts as France’s supreme court for administrative law. It suggests that the State Council will redraft the bill, adding a fine of 5000€ maximum as an intermediary sanction (before the removal of the internet access), so as to be able to modulate the degree of the sanction and take into account “the gravity of the copyright infringement”. This new measure aims to ensure that the law respects the constitutional principle of the individualization of penalties. However, this also means that the public authority will have to give a closer look to individual cases, which will slow the procedure and increase its functioning cost, thus undermining its effectiveness in fighting illegal downloading. Additionally, it is worth noting that for various other reasons the bill has received negative notices from the national telecom regulator (Acerp) and a number of French deputies. According to several sources, the National Commission for Information and Liberties (CNIL) will also give a highly critical opinion on the project. In the face of all these troubles, it seems that the Government will now postpone the legislative procedure until the fall, much to the despair of right holders. But today, I came upon this interesting article on the Electronic Frontier Foundation’s website. At the moment, the US, Canada, the EU, Japan and other countries are negotiating a trade treaty outside of the WTO framework. According to the EFF, a leaked memo indicates that the current draft for this Anti-Counterfeiting Trade Agreement (ACTA) mentions, among many other things, “new legal regimes to encourage ISPs to cooperate with right holders, criminal measures, and increased border search powers” (further information on this memo here). It is still very unsure what this treaty is all about, but what is for certain is that treaties are superior to the Law once they have been ratified. If the ACTA came into effect, it would be a pretty insidious way to harmonize legislations on a rather conservative standard. All this indicates that worldwide intellectual property lobbies are striving to maintain the status quo on cultural rights, even if it means undermining civil liberties. Instead, they should put as much efforts into thinking of other ways to reward artists and cultural industries in the age of the internet. Will New Media Dissolve the Political Community? I just read this interesting article by Henry Jenkins, the well-known media scholar. Even though this piece dates back to three years ago, it is still very relevant to the debate on the democratic impact that new media might have on the functioning of our democracies. Jenkins responds to some authors who bemoan the fragmentation of audiences across a wide variety of sources, arguing that the marginalization of mainstream broadcasters will undermine social cohesion and democratic participation. First, Jenkins says, new media won’t replace traditional media. The two will coexist . It is an argument that he previously developed in this editorial for the Technology Review in June 2001. Delivery technologies might converge and overtime we might access all sorts of media through the same machine, but the media themselves will survive. Although I’m pretty convinced, one can’t ignore that traditional media (namely TV networks and newspapers) are having a lot of issues adapting to the arrival of new competitors and the subsequent diverting of ad revenues (think not only to online media but also to the arrival of new digital TV channels, free press and innovative services such as VOD). New technologies are going to spark a huge restructuring of this once secure industry. Although these media will remain, their organization is likely to be significantly modified in this new media architecture. Secondly, Jenkins refutes the view that new media are detrimental to social cohesion, saying that it overlooks the fact that internet communities are very different from real world ones. Whether it be politically, generationally or geographically, they are usually much more diverse. In addition, internet-based communities members engage in a myriad of online activities so that they end up circulating ideas across a very wide range of audiences. Therefore, what the net creates is not segregation but more debate. Online social interactions bring some fresh air to democracy, propagating information that was once neglected by opinion leaders, thus “challenging the consensus” as Jenkins puts it. They empower citizens by fostering political participation and create welcome checks and balances to our political systems.This is why it is so important to close the digital gap. Photo on Flickr by kjetil_r under Creative Commons License. Author felixPosted on 02/06/2008 Categories Uncategorized2 Comments on Will New Media Dissolve the Political Community? I wanted to have a sort of diary where I could write down observations and reflections about the way our society is being transformed by ICT, how they bring about social change. I used to want to work in the music industry and grew more and more fascinated by the way the internet transforms the way people access cultural goods thus challenging traditional business models. Then I realized I liked politics too much to just focus on the music sector. From a more global point of view, however, the digital revolution is even richer. Information and communication technologies are altering the whole society, how we live and interact, and bring their own set of issues as well as fantastic opportunities. First and foremost, ICT are having enormous political implications, and in that respect, chances are the revolution has barely begun. They’re transforming the way people access information (with the diversification of media sources), the way they can produce and broadcast content but also the way they relate to the State (with the development of i-government, e-administration and e-democracy). Secondly, they represent an incredible potential for the economy. With a growth of 5,9% in 2006-2007, the ICT industry is the fastest growing sector in the European Union. The spread of new technologies in the rest of the economy also counted for half of all the productivity gains of the region between 2000 and 2004. Finally, the development of green IT suggests the huge contribution that new technologies could have in building a sustainable economic growth. ICT are redefining the polis… and I’ll be able to say “I was there”. Author felixPosted on 01/06/2008 Categories Uncategorized1 Comment on Why this blog? We the Net est un blog de recherche tenu par Félix Tréguer sur les luttes de pouvoir associées à Internet. Voir la liste des travaux.